Over the past decade, the South China Sea has become one of the most volatile flashpoints in East Asia. China, Vietnam, the Philippines, Malaysia, Brunei and Taiwan each assert sovereignty over part or all of the sea, and these overlapping claims have led to diplomatic and even military standoffs in recent years. Because the sea hosts numerous island chains, is rich in mineral and energy resources and has nearly a third of the world’s maritime shipping pass through its waters, its strategic value to these countries is obvious. For China, however, control over the South China Sea is more than just a practical matter and goes to the center of Beijing’s foreign policy dilemma: how to assert its historic maritime claims while maintaining the non-confrontational foreign policy established by former Chinese leader Deng Xiaoping in 1980. China staked its modern claim to control of the sea in the waning days of the Chinese Civil War. Since most of the other claimant countries were occupied with their own independence movements in the ensuing decades, China had to do little to secure this claim. However, with other countries building up their maritime forces, pursuing new relationships and taking a more active stance in exploring and patrolling the waters, and with the Chinese public hostile to any real or perceived territorial concessions on Beijing’s part, Deng’s quiet approach is no longer an option. China is a vast continental power, but it also controls a long coastline, stretching at one time from the Sea of Japan in the northeast to the Gulf of Tonkin in the south. Despite this extensive coastline, China’s focus has nearly always turned inward, with only sporadic efforts put toward seafaring and even then only during times of relative security on land. Traditionally, the biggest threats to China were not from sea, except for occasional piracy, but rather from internal competition and nomadic forces to the north and west. China’s geographic challenges encouraged a family-based, insular, agricultural economy, one with a strong hierarchal power structure designed in part to mitigate the constant challenges from warlords and regional divisions. Much of China’s trade with the world was undertaken via land routes or carried out by Arabs and other foreign merchants at select coastal locations. In general, the Chinese chose to concentrate on the stability of the population and land borders over potential opportunities from maritime trade or exploration, particularly since sustained foreign contact could bring as much trouble as benefit. Two factors contributed to China’s experiments with naval development: a shift in warfare from northern to southern China and periods of relative national stability. During the Song dynasty (960-1279), the counterpart to the horse armies of the northern plains was a large inland naval force in the riverine and marshy south. The shift to river navies also spread to the coast, and the Song rulers encouraged coastal navigation and maritime trade by the Chinese, replacing the foreign traders along the coast. While still predominately inward-looking during the Yuan dynasty (1271-1368) under the Mongols, China carried out at least two major naval expeditions in the late 13th century — against Japan and Java — both of which ultimately proved unsuccessful. Their failure contributed to China’s decision to again turn away from the sea. The final major maritime adventure occurred in the early Ming dynasty (1368-1644), when Chinese Muslim explorer Zheng He undertook his famous seven voyages, reaching as far as Africa but failing to use this opportunity to permanently establish Chinese power abroad. Zheng He’s treasure fleet was scuttled as the Ming saw rising problems at home, including piracy off the coast, and China once again looked inward. At about the same time that Magellan started his global expedition in the early 1500s, the Chinese resumed their isolationist policy, limiting trade and communication with the outside and ending most consideration of maritime adventure. China’s naval focus shifted to coastal defense rather than power projection. The arrival of European gunboats in the 19th century thoroughly shook the conventional maritime logic of Chinese authorities, and only belatedly did they undertake a naval program based on Western technology. Even this proved less than fully integrated into China’s broader strategic thinking. The lack of maritime awareness contributed to the Qing government’s decision to cede its crucial port access at the mouth of the Tumen River to Russia in 1858, permanently closing off access to the Sea of Japan from the northeast. Less than 40 years later, despite building one of the largest regional fleets, the Chinese navy was smashed by the newly emergent Japanese navy. For nearly a century thereafter, the Chinese again focused almost exclusively on the land, with naval forces taking a purely coastal defense role. Since the 1990s, this policy has slowly shifted as China’s economic interconnectedness with the world expanded. For China to secure its economic strength and parlay that into stronger global influence, the development of a more proactive naval strategy became imperative. To understand China’s present-day maritime logic and its territorial disputes with its neighbors, it is necessary to first understand the so-called nine-dash line, a loose boundary line demarcating China’s maritime claims in the South China Sea. The nine-dash line was based on an earlier territorial claim known as the eleven-dash line, drawn up in 1947 by the then-ruling Kuomintang government without much strategic consideration since the regime was busy dealing with the aftermath of the Japanese occupation of China and the ongoing civil war with the Communists. After the end of the Japanese occupation, the Kuomintang government sent naval officers and survey teams through the South China Sea to map the various islands and islets. The Internal Affairs Ministry published a map with an eleven-dash line enclosing most of the South China Sea far from China’s shores. This map, despite its lack of specific coordinates, became the foundation of China’s modern claims, and following the 1949 founding of the People’s Republic of China, the map was adopted by the new government in Beijing. In 1953, perhaps as a way to mitigate conflict with neighboring Vietnam, the current nine-dash line emerged when Beijing eliminated two of the dashes. The new Chinese map was met with little resistance or complaint by neighboring countries, many of which were then focused on their own national independence movements. Beijing interpreted this silence as acquiescence by the neighbors and the international community, and then stayed largely quiet on the issue to avoid drawing challenges. Beijing has shied away from officially claiming the line itself as an inviolable border, and it is not internationally recognized, though China regards the nine-dash line as the historic basis for its maritime claims. Like other claimant countries such as Vietnam and the Philippines, China’s long-term goal is to use its growing naval capabilities to control the islands and islets within the South China Sea and thus the natural resources and the strategic position they afford. When China was militarily weak, it supported the concept of putting aside sovereignty concerns and carrying out joint development, aiming to reduce the potential conflicts from overlapping claims while buying time for its own naval development. Meanwhile, to avoid dealing with a unified bloc of counterclaimants, Beijing adopted a one-to-one negotiation approach with individual countries on their own territorial claims, without the need to jeopardize its entire nine-dash line claim. This allowed Beijing to remain the dominant partner in bilateral negotiations, something it feared it would lose in a more multilateral forum. Despite the lack of legal recognition for the nine-dash line and the constant friction it engenders, Beijing has little ability now to move away from the claim. With the rising international attention and regional competition over the South China Sea, the Chinese public — which identifies the waters within the nine-dash line as territorial waters — is pressuring Beijing to take more assertive actions. This has left China in an impossible position: When Beijing attempts to portray joint developments as evidence that other countries recognize China’s territorial claims, the partner countries balk; when it tries to downplay the claims in order to manage international relations, the Chinese population protests (and in the case of Chinese fishermen, often act on their own in disputed territory, forcing the government to support them rhetorically and at times physically). Any effort to appeal to Beijing’s domestic constituency would risk aggravating foreign partners, or vice versa. The complications from the nine-dash line, the status of domestic Chinese developments and the shifting international system have all contributed to shape China’s evolving maritime strategy. Under former leader Mao Zedong, China was internally focused and constrained by a weak navy. China’s maritime claims were left vague, Beijing did not aggressively seek to assert its rights and the independence struggles of neighboring countries largely spared China from taking a stronger maritime stance. China’s naval development remained defensive, focused on protecting its shores from invasion. Deng Xiaoping, in concert with his domestic economic reforms in the late 1970s and early 1980s, sought the more pragmatic joint economic development of the East and South China seas, putting aside claims of territorial sovereignty for another time. China’s military expenditures continued to focus on land forces (and missile forces), with the navy relegated to a largely defensive role operating only in Chinese coastal waters. To a great degree, Deng’s policies remained in place through the next two decades. There were sporadic maritime flare-ups in the South China Sea, but in general, the strategy of avoiding outright confrontation remained a core principle at sea. China’s navy was in no position to challenge the dominant role of the U.S. Navy or to take any assertive action against its neighbors, especially since Beijing sought to increase its regional influence through economic and political means rather than through military force. But joint development proposals for the South China Sea have largely failed. China’s expanded economic strength, coupled with a concomitant rise in its military spending — and more recently its focus on naval development — has raised suspicions and concerns among neighboring countries, with many calling on the United States to take a more active role in the region to counterbalance China’s rise. The issue of the nine-dash line and territorial claims have also risen in significance because countries had to file their maritime claims under the U.N. Convention on the Law of the Sea, bringing the competing claims a step closer to international arbitration. China, which was a signatory to the treaty largely due to its potential maritime gains in the East China Sea, found itself forced to file numerous counterclaims in the South China Sea, raising alarm in neighboring countries of what was seen as an outright push for regional hegemony. It was not only counterclaimant nations that considered the Chinese moves troubling. Japan and South Korea are heavily dependent on the South China Sea as an energy transit corridor, and the United States, Australia and India among others depend on the sea for trade and military transit. All these countries saw China’s moves as a potential prelude to challenging free access to the waters. China responded with increasingly assertive rhetoric as well as a larger role for the Chinese military in foreign policy decisions. The old policy of non-confrontation was giving way to a new approach. In 1980, Deng expressed the shape of Chinese foreign policy as one in which China should observe the world, secure its position, deal calmly with foreign affairs, hide its capabilities and bide its time, maintain a low profile and never claim leadership. These basic tenets remain the core of Chinese foreign policy, either as guidelines for action or excuses for inaction. But China’s regional and domestic environment has shifted significantly from the early days of Deng’s reforms, and China’s economic and military expansion has already passed Deng’s admonition to hide capabilities and bide time. Beijing understands that only through a more proactive policy can China expand from a solely land-based power to a maritime power and reshape the region in a manner beneficial to its security interests. Failure to do so could enable other regional states and their allies, namely the United States, to contain or even threaten China’s ambitions. At least four elements of Deng’s policies are currently under debate or changing: a shift from noninterference to creative involvement; a shift from bilateral to multilateral diplomacy; a shift from reactive to preventative diplomacy; and a move away from strict nonalignment toward semi-alliances. Creative involvement is described as a way for China to be more active in preserving its interests abroad by becoming more involved in other countries’ domestic politics — a shift from noninterference to something more flexible. China has used money and other tools to shape domestic developments in other countries in the past, but an official change in policy would necessitate deeper Chinese involvement in local affairs. However, this would undermine China’s attempts to promote the idea that it is just another developing nation helping other developing nations in the face of Western imperialism and hegemony. This shift in perception could erode some of China’s advantage in dealing with developing nations since it has relied on promises of political noninterference as a counter to Western offers of better technology or more development resources that come with requirements of political change. China has long relied on bilateral relations as its preferred method of managing its interests internationally. When China has operated within a multilateral forum, it has often shaped developments only by being a spoiler rather than a leader. For example, China can block sanctions in the U.N. Security Council but has rarely proffered a different path for the international community to pursue. Particularly through the 1990s, Beijing feared its relatively weak position left it little to gain from multilateral forums, and instead put China under the influence of the stronger members. But China’s rising economic power has shifted this equation. China is pursuing more multilateral relationships as a way to secure its interests through the larger groups. China’s relations with the Association of Southeast Asian Nations, its participation in the Shanghai Cooperation Organization and its pursuit of trilateral summits are all intended to help Beijing shape the policy direction of these blocs. By shifting to the multilateral approach, China can make some of the weaker countries feel more secure and thus prevent them from turning to the United States for support. Traditionally, China has had a relatively reactive foreign policy, dealing with crises when they emerge but often failing to recognize or act to prevent the crises before they materialize. In places where Beijing has sought access to natural resources, it has often been caught off-guard by changes in the local situation and not had a response strategy prepared. (The division of Sudan and South Sudan is one recent example). Now, China is debating shifting this policy to one where it seeks to better understand the underlying forces and issues that could emerge into conflict and act alone or with the international community to defuse volatile situations. In the South China Sea, this would mean clarifying its maritime claims rather than continuing to use the vague nine-dash line and also more aggressively pursuing ideas for an Asian security mechanism, one in which China would play an active leadership role. China’s stance on alliances remains the same as that put forward by Deng in the 1980s: It does not engage in alliance structures targeted against third countries. This was both to allow China to retain an independent foreign policy stance and to avoid international entanglements due to its alliances with others. For example, Chinese plans to retake Taiwan were scuttled by its involvement in the Korean War, and thus its relations with the United States were set back by decades. The collapse of the Cold War system and the rise of China’s economic and military influence have brought this policy under scrutiny as well. Beijing has watched cautiously as NATO has expanded eastward and as the United States has strengthened its military alliances in the Asia-Pacific region. Beijing’s non-alliance policy leaves China potentially facing these groups alone, something it has neither the military nor the economic strength to effectively counter. The proposed semi-alliance structure is designed to counter this weakness while not leaving China beholden to its semi-alliance partners. China’s push for strategic partnerships (even with its ostensible rivals) and increased military and humanitarian disaster drills with other nations are part of this strategy. The strategy is less about building an alliance structure against the United States than it is about breaking down the alliance structures that could be built against China by getting closer to traditional U.S. partners, making them less willing to take strong actions against China. In its maritime strategy, Beijing is working with India, Japan and Korea in counterpiracy operations and engaging in more naval exchanges and offers of joint exercises and drills. China’s world is changing. Its emergence as a major economic power has forced Beijing to rethink its traditional foreign policy. Closest to home, the South China Sea issue is a microcosm of China’s broader foreign policy debate. The ambiguity of China’s maritime claim was useful when the region was quiet, but it is no longer serving China’s purposes, and coupled with the natural expansion of China’s maritime interests and naval activity it is instead exacerbating tensions. Old policy tools such as trying to keep all negotiations bilateral or claiming a hands-off approach are no longer serving China’s needs. 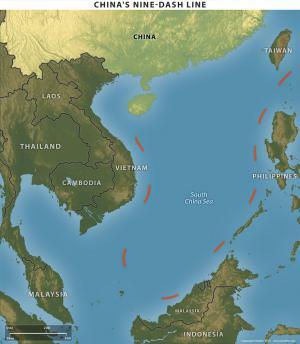 The policy of joint development inherited from Deng has failed to bring about any significant cooperation with neighboring countries in the sea, and the assertion of the nine-dash line claims amid the U.N. sea treaty filings has simultaneously increased domestic Chinese nationalism and countermoves by neighboring countries. Despite the lack of clarity on its maritime policy, China has demonstrated its intent to further consolidate its claims based on the nine-dash line. Beijing recognizes that policy changes are needed, but any change has its attendant consequences. The path of transition is fraught with danger, from disgruntled domestic elements to aggressive reactions by China’s neighbors, but by intent or by default, change is happening, and how the foreign policy debate plays out will have lasting consequences for China’s maritime strategy and its international position as a whole. How Much Power Does China’s ‘People’s’ Army Have? Heated rhetoric out of Chinese military commentators in recent months has some observers wondering whether the People’s Liberation Army (PLA) is playing an increasing role in Beijing’s foreign and national security policymaking. China’s ostensibly more assertive turn—seemingly in line with hawkish pundits—even if more clever, makes the question of military influence in Zhongnanhai important for understanding whether the U.S. policy of shaping China is actually working. Can the apparently rising influence in Beijing of the PLA be explained without resorting to the regularly heated rhetoric from hawkish commentators—whose authority is at best unclear—such as the prolific Yang Yi and Luo Yuan? The short answer is yes and evidence is accumulating to this effect. The full implications of PLA influence, however, are far from clear. First, at a time when political factions seem less coherent and relevant than before, observers should note the PLA controls just over 20 percent of the Central Committee—the body that ostensibly selects the Politburo and its Standing Committee. The PLA may not be a kingmaker; however, it may be able to veto senior selections at the 18th Party Congress this fall. This potentially puts the military in the position to extract concessions, collect promises, and encourage the politically ambitious to support PLA preferences. Observers however should be careful not to read too much into this—at least not without further research. The last major study of PLA factions was published almost 20 years ago and we do not know the cohesion of the PLA’s Central Committee representation as a power bloc. Moreover, the PLA has only two seats on the Politburo and none on the Standing Committee, so the military’s role in politicking may be indirect and not necessarily day-to-day. Second, as David Finkelstein of CNA Corporation noted earlier this year, the PLA also can present the leadership with policy options. During the 1995/96 Taiwan Strait crises, the PLA had to admit to the civilian leadership that it could do very little either to Taiwan or to the U.S. forces deployed to the area. That is no longer the case today. Whether the evacuation of Chinese citizens from Libya or the anti-piracy patrols in the Gulf of Aden or new capabilities to coerce (but not take) Taiwan, the PLA has proven it has something to offer Chinese policymakers. Those who can present options and solutions almost always win out at the decision-making table over those who present only obstacles. Third, the PLA is becoming increasingly professional as a fighting force with a wider array of capabilities across the land, sea, air, and space domains. In pursuit of modernization, the Chinese military is trying to break down the service stovepipes across these domains. The growing focus on precision operations on top of a “system of systems operational capabilities” to cross these stovepipes will allow the PLA to fight in a fundamentally different way. The PLA repeatedly has surprised observers with the pace of its modernization; however, it is still an army in transition amidst great change in doctrine and technology. This means understanding what the PLA can do is a far more difficult task than it was when China invaded Vietnam in 1979 or sent the “People’s volunteers” into Korea in 1950. Fourth, today’s civilian leadership has almost no direct experience with military affairs and must rely entirely on the PLA for military and, to a slightly lesser extent, political-military expertise. Unlike Mao Zedong or Deng Xiaoping, Hu Jintao and his apparent successor Xi Jinping do not have the direct experience with using military force to achieve political ends and probably have to rely on others for that expertise. In a system that deliberately limits civilian access to the military, this means Hu and Xi must depend in large part on their limited experience with military affairs to make judgments about appropriate courses of action. Do they know what questions to ask? Does the PLA present jargon-free, sensible decision memos that they understand? How responsive is the PLA and the Central Military Commission staff to requests for further information? It also is not clear if Hu and Xi can find intellectual support when they need it. Whether searching for military affairs articles on the China National Knowledge Infrastructure or perusing Chinese bookstores, PLA authors dominate strategic studies. In contrast to the United Kingdom or the United States, China does not seem to have a well-developed civilian defense analysis sector. If the White House, for example, wants an alternative assessment to the Pentagon, it can go to any of a number of research institutes and think tanks—e.g. Center for Strategic and Budgetary Assessments, Center for Strategic and International Studies, and the Center for a New American Security to name but a few, and not counting the Federally-Funded Research and Development Centers—and get professionally done military analysis. If Zhongnanhai however wants to shake the trees, it is not clear that China’s leaders can get any assessment independent of the PLA. This gives the PLA tremendous power—even unintentionally—to obscure what it is really doing and the full implications of its actions without penetrating scrutiny. Observers often point to the anti-satellite missile test in 2007 as a sign that China’s decision-making process lacks coordination. Some suggested the senior civilian leadership was not informed—or fully informed. But what if the PLA only presented Hu Jintao with a memo asking “Should we continue with the planned test of experimental program X?” Banal bureaucratese can hide a tremendous amount unless someone has the time and energy to pursue the full implications. And at that time, Hu was the only civilian with authority over the PLA. The PLA’s influence probably is increasing for a number of reasons. Irrespective of the personalities involved, the PLA is well-positioned to press its interests and its views within the Chinese foreign and national security policymaking apparatus. However, it remains unclear whether there is an institutional voice on party politics and national policy—not just the PLA’s material interests and how to fight—and whether that voice is coherent across the military’s different branches. Even if the PLA has a greater say in Chinese foreign and national security policy, what the PLA says is not obvious. Dealing with challenges of modernization is more likely to keep the PLA focused internally and there are clear signs the PLA makes a determined effort to self-assess. The Central Military Commission headed by President Hu endorsed the most important evaluation, known as the “two incompatibles,”—PLA capabilities are incompatible with winning a war under informatized conditions and incompatible with fulfilling the PLA’s historic missions. This does not sound like hawks, constantly edging the leadership to take action. And the sophistication of PLA doctrinal and technological innovation suggests the generals are not slavering warmongers enamored of a brutish approach. The real concern should be whether China’s civilian leaders have the intellectual experience or the ability to draw on military expertise independent of the PLA to manage the PLA’s increasing competence and influence. The Party controls the gun—1.8 million out of roughly 3 million PLA and armed police personnel are party members—but this is not a question about whether the PLA is rogue or will turn on Zhongnanhai. This issue is to what extent China’s civilian policymakers, especially Hu and Xi, truly understand the capabilities and limitations of the PLA and the options it puts forward—and how that understanding affects decisions of war and peace.